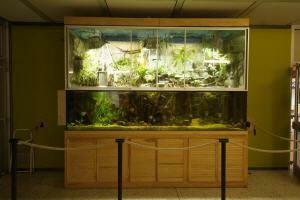 Things To Do Near Verein Der Aquarien- Und Terrarien- Freunde E.v. Verein Der Aquarien- Und Terrarien- Freunde E.v. Find hotel near Verein Der Aquarien- Und .. This aquarium in Baunatal, Germany is an entertaining attraction for children, and an educational experience for everyone. With a large variety of fish species, living in beautifully designed tanks, prepared according to the natural habitat of the species. The tanks are themed around different geographical areas including Mediterranean, Amazon, Brackish Water, Australia, Asia and others. The aquarium also organizes a frequent flea market, to raise funds for the aquarium, and overall organize a fun event for the community. So, on your trip to Baunatal, make sure you add this to your bucket list of attractions - especially when travelling with kids! Tolle Aquarien. Südsee, Nordsee, Asienbecken . Einfach Top. Mittwoch 18.00 uhr geöffnet und Sonntag 10.00 uhr jeweils 2 stunden. Einfach mal besuchen. Kann ich nur weiterempfehlen.Fachkundige Aquarianer die helfen Dir bei Problemen. ...nette Menschen, interessante Tiere! Ein Besuch lohnt sich!